William Roberts Vintage Industrial 4-Way Clothing Rack is made using black pipe and pipe fittings. 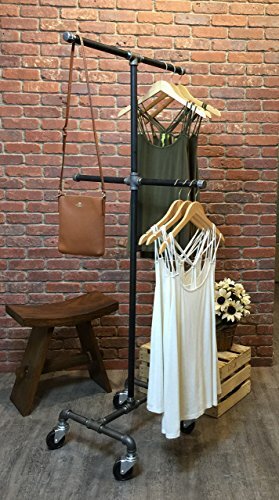 This extremely durable and long lasting design is great for any retail store or even for extra closet hanging space. The 4-Way rack is 26 inches wide and 64 inches tall. We love to make things that are custom for your needs so if you need a different size please let us know. If you have any questions about this product by William Roberts Vintage, contact us by completing and submitting the form below. If you are looking for a specif part number, please include it with your message.